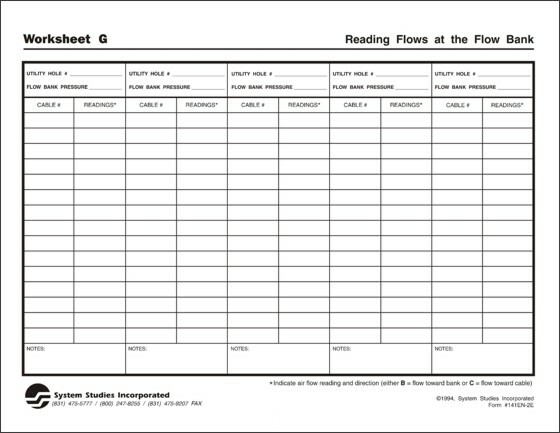 Worksheet G is used exclusively in the Flow Bank System, for both routine and alarm leak locating. When used to list pressure and flow readings, the worksheet provides an ongoing record of the system's status. The worksheet is used to record flow readings for each cable at all Flow Bank locations. Flow Bank pressure is also recorded, as well as the direction of the flow for each cable-either towards the Flow Bank or towards the cable. When all flows are recorded for each Flow Bank location, technicians can prioritize the flows, from highest to lowest, and begin routine leak locating on the cables to locate and fix the biggest leaks first. Side one of Worksheet G is used to record the utility hole number, Flow Bank pressure, cable number, and flow reading. Side two lists the procedure for reading Flow Bank pressure and cable flows. It also provides space to record the task number and cable ticket information. Side two includes a Review Checklist, the equipment required for obtaining readings, and a place to record the total flow of all the Flow Banks.